What you see before you is some pretty shocking wiring, in the bottom left of the picture you can see the fuel sender, this sits at the top of the tank, it has a float arm that goes up and down with the level of the fuel, the sender has two cables that connect it to the fuel gauge and voltage is sent down it, when the float arm moves it changes the voltage by way of resistance and that is then reflected by the fuel gauge needle going up and down. From the fuel sender you can see the wires are pretty charred so it would make sense to replace those and with any luck that should resolve the issue, it didn’t. So then my brain is thinking that if the cables got melted it’s possible they shorted and have affected the actual sender unit, after a quick bit of research this seems to be a fairly common issue, 90 quid later a new sender is installed, gauge still not working, must be the actual gauge itself then, changed out the clocks, same dice, arghhhhh! This is when it gets weird, if you take the sender out of the tank and move the float arm the gauge works fine, this proves the clocks, wiring and sender unit are in fact fine, as soon as you put the sender unit back in the tank it all goes bandy, makes no sense so for now we have to guess how much fuel is in the van and have a jerry can of diesel in case we guess wrong, not ideal! So what caused the burnt wiring, most likely whoever wired up the old rover 75 electric seat didn’t really know what they were doing and used insufficient cable for the ampage the solenoid motors were pulling, they would have glowed red, melted the cable and anything else within the immediate vicinity, if it had been carpet on top of the wires instead of foam and rubber mats, the van would have most likely have up in flames, it’s a mircale it didn’t. 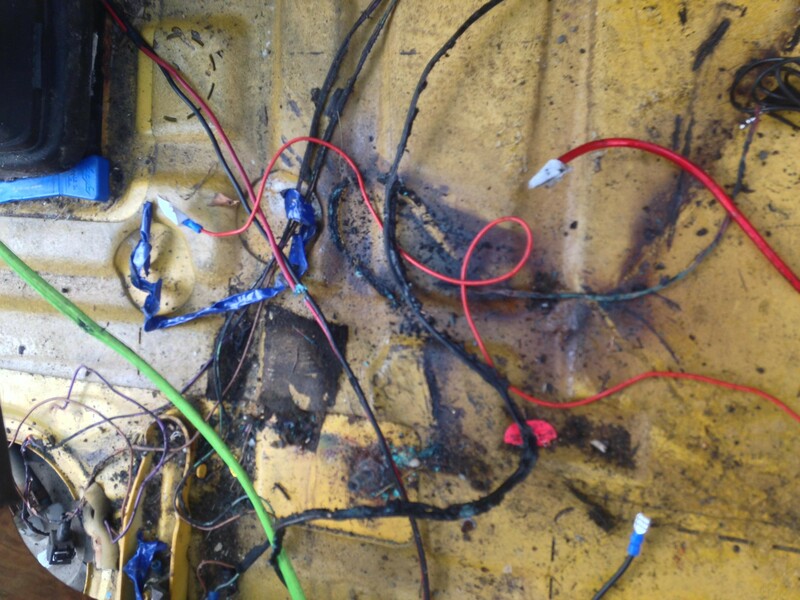 If they had run the cables away from the fuel sender wires then our fuel gauge would probably have worked! I spent a long time on this but eventually go to the bottom of the problem, of all things, a bad earth.. Turns out the melted wiring hadn’t effected the gauge at all, it was the earth that comes from the battery to the chassis that was the issue. Somewhere along the line someone had messed about with it and the way it had been fastened to the chassis it could never have made a ground contact. Who knew a bad earth would effect only one thing so dramatically ! On the upside, I no longer have to guess how much fuel is in the van, still keeping that 5 litre jerry can in the back tho, you never know ! 4. If your earths are good and it still doesn’t work search the forums, there aren’t too many other causes but they are explained in greater detail on the VW T4 forum. If your fuel gauge and or speedo and temp gauge go up the wall and you have the old green style clocks, you need to check this out.